"Regional IP head Dragomir Kojić assists blue-chip clients with the management of trade mark portfolios, copyright protection and advertising. He represented Jaffa in trade mark registration and maintenance proceedings. He also advises on data protection." 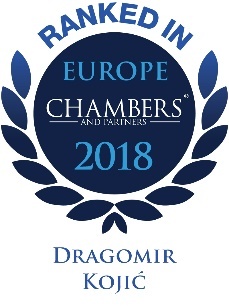 Dragomir is a head of the Intellectual Property Practice Group. He is well-known for his clear and practical approach to all intellectual property issues. Dragomir has been especially proactive in promoting the importance of intellectual property protection and has been actively involved in many international IPR conferences, presentations and trainings related to software anti-piracy. University of Novi Sad, Faculty of Law (2001), LL.M. University of Novi Sad, Faculty of Law (1997), LL.B.